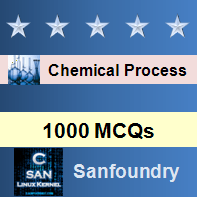 This set of Chemical Process Calculation Multiple Choice Questions & Answers (MCQs) focuses on “Temperature”. Explanation: Both a) and b) are correct for these units of temperatures. Explanation: ∆˚F = ∆˚R, ∆˚C = ∆˚K, ∆˚C = 1.8 ∆˚F and ∆˚K = 1.8∆˚F. Heat capacity = 311.4 + 0.128 T, where temperature (T) is expressed in ˚C. What is the relation of temperature with heat capacity if the temperature is expressed in terms of ˚R? Explanation: ˚C = (˚R – 460 – 32)/1.8. Cp = 22.5 + 2.56 T, where Cp is in J/g.mol.˚C. What is the expression for heat capacity if the temperature is expressed in ˚R and Cp in Btu / lb.mole.˚R? Explanation: ˚C = (˚R – 460 – 32)/1.8 and 1 Btu = 1055 Jule. Explanation: Boiling temperature of water is 100 ˚C. 6. Temperature can`t be expressed as? Explanation: All a, b, c are the units of temperature. Explanation: ∆˚C = 1.8 ∆˚F and ∆˚K = 1.8∆˚F. 8-10. Temperature of a body is raised 25 ˚C by external heating. 8. Change in temperature on Kelvin scale is? 9. Change in temperature on Fahrenheit scale is? Explanation: ∆˚C = 1.8 ∆˚F. 10. Change in temperature on Rankine scale is?